From three former college quarterbacks comes an elite football camp made specifically for Junior High athletes. Tim Turman and sons Matt and Seth Turman know that the most successful and skilled football players are masters of great technique. They also know that this level of coaching simply isn't available for many younger players. With this thought and a passion for developing star quarterbacks, the Turmans started The Turman Quarterback Acadamy. Shorts, t-shirt and football shoes. A Certified Athletic Trainer (ATC) will be monitoring ALL camp sessions. HURRY - Limited to the first 35 athletes! *By completing and submitting this form, I hereby certify that my son is physically able to participate in The Turman Quarterback Academy football camp and agree to the disclaimer at the bottom of this site. Your $100 registration payment will be processed securely via Paypal. *The Coaches and/or Camp Directors are not responsible for bodily injury or property damage sustained by participants. The participants need to be insured under their parent’s health and accidental or medical insurance coverage. Registration into this camp hereby waives, releases, absolves, indemnifies and agrees the registrant to hold harmless all coaches, Skutt Catholic High School, the organizers, sponsors, participants and person transporting athletes to or from activities; for any claim arising out of an injury to the athlete whether the result of negligence or from any other cause. In the event of a medical emergency affecting the athlete, the registrant hereby gives consent to seek emergency medical treatment. No refunds will be issued. Seth graduated from Bishop Neumann High School in 1997 where he was a 4-year starting quarterback. As a scholarship quarterback at the University of Nebraska at Omaha, Seth started for two years and was team captain. Seth led the Mavericks to two consecutive years in the DII playoffs. Seth currently coaches quarterbacks as the Offensive Coordinator at Millard West High School and has won both a State Championship and two Runner-Up titles. In his 11 years of coaching experience, Seth has seen three of his quarterbacks go on to compete at the collegiate level. At Bishop Neumann High School, Matt was a 3-year starting quarterback and All-State player. Matt walked-on at the University of Nebraska–Lincoln where he started at quarterback in critical games leading to two National Championships. Matt took what he learned from Husker Coach Tom Osborne and Nebraska QB Coach Turner Gill with him to coach high school quarterbacks. Matt is currently the head coach at Skutt Catholic High School where he has 3 State Championships and 3 Runner Up titles. Tim was a starting quarterback for Alliance St. Agnes High School. After graduation, he was a record-setting QB at Chadron State College and was inducted into their Hall of Fame. He was also invited to the Dallas Cowboy Football Camp. 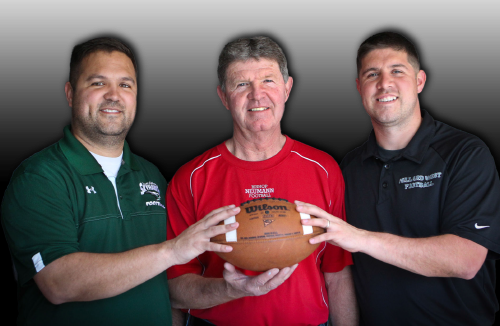 Tim has been the head coach at Bishop Neumann High School for 37 years. He has coached with the Shrine Bowl, helped with camps at UNL, has spoken at the Nebraska Coach’s Clinic and many other college clinics. Coach Turman is the sixth winningest coach in Nebraska football history with 298 Wins!